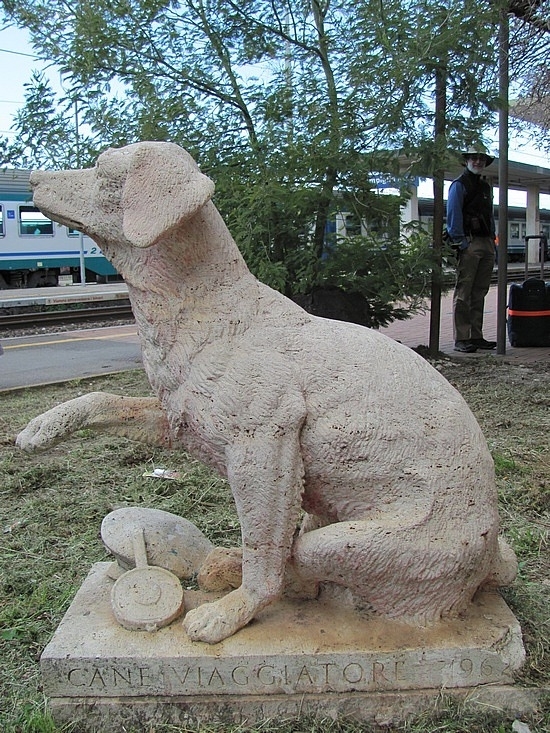 At the main station of Campiglia Marittima, within sight of Elba island, stands a memorial to a mongrel called Lampo, beloved by every trainman in Italy. There is an interesting tale behind that statue. The monument to “the traveling dog” shows Lampo seated on a pedestal, holding his right paw up. Facing the railroad tracks, he watches the trains come and go. Born in the United States and taken to Italy in 1953 as a puppy by American sailors, Lampo was no stranger to Italian television. And just about every newspaper had published an article about the little dog, who had the most unusual hobby any dog ever had. The inscription around the base of the statue tells little about Lampo. However, if you want to know all the details, you should read a book written by Lampo’s owner, Elvio Barlettani: the assistant station master. “What Lampo did,” says Barlettani (who adopted the white haired dog) “was to live a life different from that of other dogs. Lampo liked traveling in trains – and because he got to know their schedules and could distinguish the slow trains from the expresses, he managed to go somewhere every day by train”. Lampo, whose name in Italian means “flash of lightning,” made over 3,000 trips. 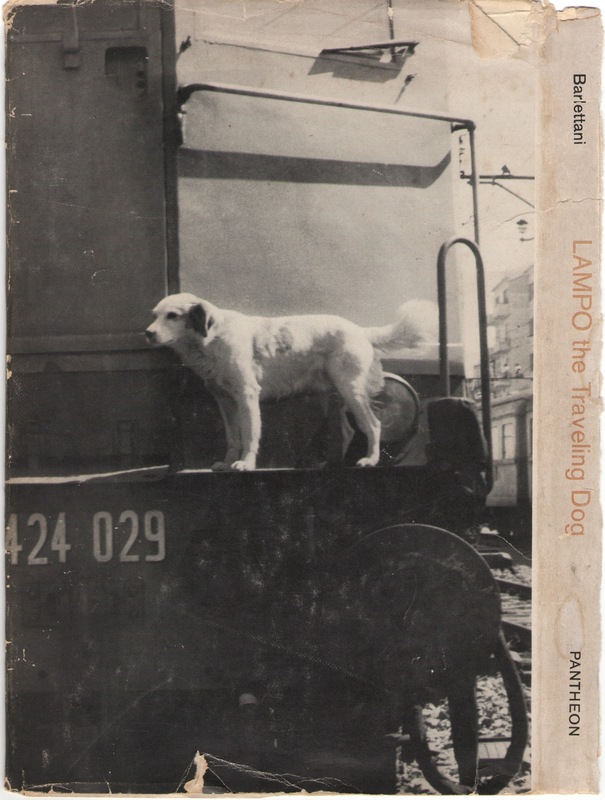 When he made his first long journey, all the way to Rome, Barlettani got a call from the station master there, asking whether they should put the dog on the proper train for home. Barletani said no, let the dog find his own way back. Sure enough, late that evening, Lampo jumped off the Rome-Turin express at the Campiglia Marittima station. After that there was no stopping for the traveling dog. His fame spread. Platform workers everywhere would affectionately tie all kinds of railway ticket stubs to his collar to indicate where he had been. Some of the staff even stuck imitation tickets on his tail with the words, “Free pass for Lampo,” and anybody who tried to take away these special passes would get a ferocious snarl from the railroad rover. Only once in eight years Lampo missed a return train: he went past his stop. However, he got back to his home station by taking a series of connecting trains. Lampo’s railroad adventures came to an end on the evening of July 22, 1961. Ironically, the four legged hitchhiker died under the wheels of a freight train, the kind he had always avoided, since passenger trains were his preference. The accident happened at the Capiglia Marittima station, following an illness which had kept him indoors. He was not at his best that day and even needed a boost from a trainman to help him scramble up the steps of a local. Today Lampo has come back to the Campiglia Marittima station to stand guard over the train traffic. There are people who claim that the lifelike statue lets out a bark whenever a train pulls in a few minutes behind schedule. you didnt mention about a beatiful book by Roman Pisarski about the story of this dog. Heartbreaking!